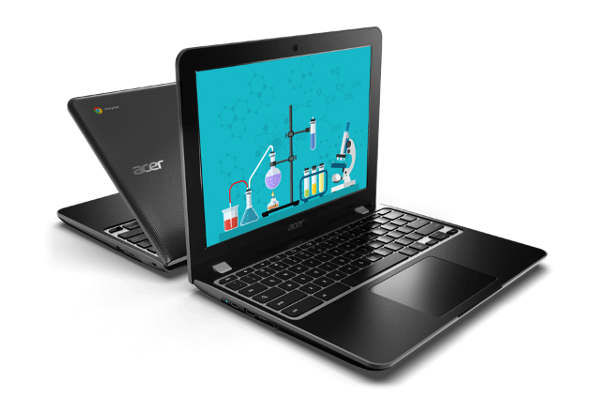 ACER debuts Chromebook Spin 512 (R851TN) and Chromebook 512 (C851/C851T) for students. Acer today debuted its first 12-inch Chromebooks, the Chromebook Spin 512 and Chromebook 512, for students and education customers. The new Chromebooks feature a 3:2 aspect ratio display - a ratio that falls between the ratio used in books and mobile media, and similar to using pen and paper. The new Acer Chromebooks' displays have a productivity-boosting 3:2 aspect ratio for 18 percent more vertical space compared to an equally wide 16:9 display. As a result, students can view more text, maps, photos and schoolwork in a single viewing. The 12-inch HD+ displays feature 1366 x 912 resolution and IPS technology. The convertible Acer Chromebook Spin 512's 360-degree hinge lets students use the display in four modes: clamshell, tablet, display and tent. An included dockable Wacom electro-magnetic resonance (EMR) stylus makes note-taking and sketching natural and can be conveniently stored in the device slot. The Acer Chromebook 512 features a traditional notebook design with touch and non-touch options. The Acer Chromebook 512 can be opened a full 180 degrees to lay flat on a desk for sharing with other students during classes or for school projects. Plus, the Acer Chromebook 512 has mechanically anchored keys that are both difficult to remove and easy to replace, making them ideal for shared classroom environments. The Chromebook Spin 12 is powered by up to a quad-core Intel Pentium Silver N5000 processor or a quad core Intel Celeron N4100 processor. In addition, the Acer Chromebook 512 offers a dual core Intel Celeron N4000 processor. The new Acer Chromebooks will be available with either 32 or 64 eMMC storage and 4 or 8GB of RAM. The Acer Chromebook Spin 512 features an 8MP world-facing webcam on the cover, while the clamshell version has an optional 5MP. The Acer Chromebook Spin 512 and Chromebook 512 provide long battery life of up to 12 hours, enough for several days of classroom use or day-to-night support for students in 1:1 programs. The new Acer Chromebook Spin 512 and Acer Chromebook 512 are compliant with the stringent U.S. MIL-STD 810G military standards. They can take handle drops from heights of up to 122 cm (48 inches) and handle up to 60 kg (132 pounds) of downward force thanks to a reinforced design and shock-absorbing bumper. In addition, the new Acer Chromebooks are designed for use by younger children; they have been certified to meet two leading toy safety standards: the ASTM F963-16 and UL/IED 60950-1. The keyboard is spill-resistant with a gutter system that routes water away from internal components and drains out the bottom of the chassis, providing protection against spills of up to 330 ml (11 fluid ounces) of water. Plus, the touchpads are moisture-resistant, and the Acer Chromebook 512's keyboard is easily serviceable by local IT departments. The Acer Chromebook Spin 512's touch display is covered with Antimicrobial Corning Gorilla Glass, a cleaner, tougher cover glass made possible by an antimicrobial compound that resists the growth of odor and stain causing microorganisms on touch displays. It's scratch-resistant and ideal for students who may share it or use it in different environments throughout the day. Students can connect to the Internet with Intel Wireless-AC 2×2 802.11ac MU-MIMO (Multi-User Multiple-Input and Multiple-Output) connectivity for a fast and reliable Gigabit Wi-Fi connection. Peripherals can be connected via Bluetooth 5.0 or by the two USB 3.1 Type-C Gen 1 ports, which can be used to charge the device as well as other products, transfer data quickly up to 5Gbps, and connect to an HD display. The Acer Chromebooks also include two USB 3.0 ports. The new Acer Chromebooks will be available with either 32 or 64 eMMC storage and 4 or 8GB of RAM to education and commercial customers in Q2, in EMEA and North America.